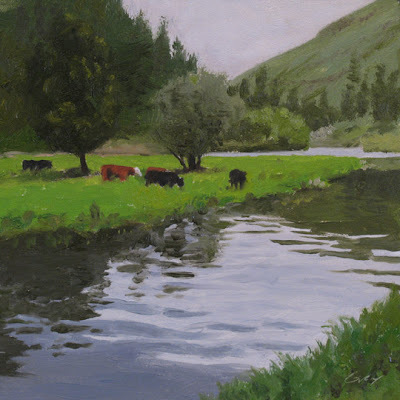 Cattle graze in luxuriant, belly-high grass along the Wallowa River. Thank you, Karie-Ann (pencilportraits.) Your drawings are lovely. Reminds me of canal boat holidays we took when I was a kid, chugging serenely through the countryside counting water voles along the banks. A lovely study. You really got the cows down. I know from experience they move just enough to be frustrating when drawing. Sounds serene, Steve--where was that? That's so true, Onpainting. The trick to painting them is to place them in the far distance and turn them into tiny rectangular globs of paint. I like the square format for these landscapes Don. I think it gives strength to the composition. Very nice light on this one. Thanks, Sheila. There is something about a square, isn't there? Cows and water. So peaceful. You do a fabulous job.